Apple might have made GarageBand free Download iMovie, GarageBand, Pages, and iWork Free for Mac and iOS Download iMovie, GarageBand, Pages, and iWork Free for Mac and iOS Every Apple user can now download Pages, Numbers, Keynote, Garageband and iMovie completely free of charge, but what are they good for? Read More for all Mac and iOS users, but there’s another free app eating up my spare time called Auxy. Winner of a 2016 Apple Design Award, the app treads a fine line between accessibility and power that makes it one of the best self-contained iOS music creation tools 5 iOS Digital Audio Workstations For Producers On a Budget 5 iOS Digital Audio Workstations For Producers On a Budget So you've transformed your iPad into an endlessly evolving musical instrument, programmed your own tight drum beats and discovered the huge potential of AudioBus. You've sacrificed disk space for samples and your bank balance for... Read More to date. 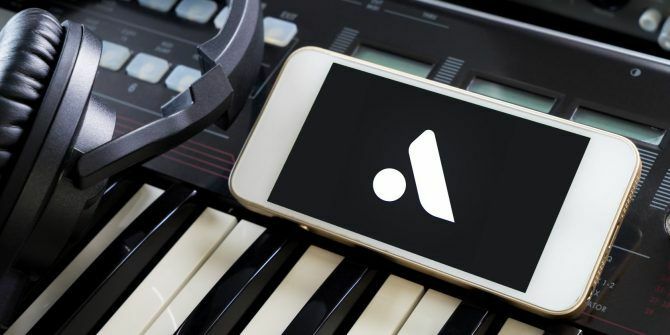 If you’ve never tried making music on your iPhone before, Auxy is the perfect introduction. The creative iOS music app scene is a crowded one. There are drum machines like DM-1 ($5) and Funkbox ($5) alongside faithful analog synth recreations like the Korg iMS-20 ($30) and Animoog ($30). There are grooveboxes like the iMPC Pro ($13) [No longer available] and iMaschine ($10) and complete self-contained studios like Gadget ($40) and Nanostudio ($7). There are even serious production tools like Auria Pro ($50) and a system for routing audio and MIDI between apps How to Use CoreMIDI for Music Production on an iPad or iPhone [iOS] How to Use CoreMIDI for Music Production on an iPad or iPhone [iOS] Apple added Core MIDI to iOS 4.2 and since then app developers have been implementing MIDI functionality into their apps. This means you can use your iOS device as both a MIDI controller and with... Read More called Audiobus ($10). While these apps are purpose-built and powerful, many lack the pick-up-and-play user-friendliness on which iOS as a platform was built. Previously the only other app that I’d fallen for like Auxy is the still-excellent and now-free app Figure [No Longer Available]. Five years after Figure’s initial release, Auxy has unseated it from the top of its user-friendly throne. Central to Auxy’s success is its note editor for creating melodies and drum patterns. Unlike Figure, which hides patterns and instead relies on exacting “live” recording and overdubbing, Auxy gives you access to possibly the best note editor ever seen in an iOS app. Understanding the note editor is easy, regardless of your level of experience. Tap to draw notes, drag to change their length, and combine multiple notes to create chords and other interesting effects. Add a drum beat, sprinkle some percussion over the top, then sit back and admire your work. Making the most of Auxy means mastering the note editor. Add instruments to tracks, then add patterns to instruments using the plus button. Each instrument can play one pattern at a time, while patterns can be dragged and moved between instruments. The whole setup is ripe for experimentation, without letting you jump too far off the deep end. At the top of each pattern you can change the number of bars within the pattern and the size of the grid (choose 1/32 for especially precise patterns). Hit the Soft button to reduce note velocity, while Solo lets you audition the current part on its own without the rest of your song. You can keep adding instruments, creating new patterns within those instruments, and even move patterns between instruments — just drag horizontally, then drop your melody or drum pattern onto another instrument. You can then use scenes to turn your collection of beats, melodies, and basslines into a song. Tap the small arrow to the right of the main scene view to add, change, and manage your scenes. A scene is essentially your choice of patterns and instruments playing for a number of bars. Tap the plus button to add a scene, drag to reorder, or tap and hold to duplicate. You can tap on a scene to change the number of bars that play, to select which bar to start on, or to move or rename it. Pay attention to the Loop button, which when tapped will loop the current scene. Disable the Loop function to play your scenes in order, like a song. As you experiment and build up confidence, you’ll get better at turning your experiment into a finished track. If you tap on the Settings button in the top-right you can change the basic settings for your current song. That includes tempo (measured in beats per minute), the key, and whether you want to use a minor, minor harmonic, or major scale. If you want the rhythm of your song to sound more natural (like a human drummer) then increase the swing. Auxy is a free app, and developers need to eat Why I Buy iPhone Apps (and You Should Too) Why I Buy iPhone Apps (and You Should Too) If I have a choice between a free app and a paid app that do very similar things, I’ll buy the paid app every time. Read More . For $5 a go, you can purchase some new sounds, including a good number of melodic instruments and a few drum kits. Choose from classical pianos to vintage analog keys, modern ambient pads, and energetic leads curated by established producers. Or don’t. You get 51 instruments to play with for free. That should keep you busy for a few weeks at least. In the time I’ve spent playing with Auxy, I’ve discovered a few things that might be useful to newcomers. Swipe left on a project, on the very first screen you see, to Duplicate it. This is handy for remixing existing songs without affecting the original. Because no actual audio is stored (just instrument parameters and instructions), your songs take up very little space at all. You can customize the sound of each instrument by tapping on it. Use the Transition button to set a start and endpoint for an effect, like a slow fade-out or cutting the high frequencies with a low-pass filter. Short one-bar scenes can be used to create fills and breaks in your song to shake things up a bit. Use these in conjunction with transitions to produce some interesting effects. Soft notes are especially useful in creating drum patterns. Changing the velocity with a few well-placed soft notes makes for a more interesting rhythm, and can be used to drastically change the feel of the beat. It’s also often a good idea to separate individual drum parts, even after you’ve constructed one large pattern. Just duplicate your instrument a few times and remove the kicks, snares, and hats as necessary. Tap and hold on an instrument to change its color, label, delete, move, or copy it. You can copy an instrument from one project, open another, and paste the instrument (complete with any patterns). You can even render each instrument and currently-selected pattern as individual uncompressed WAVs How Audio Compression Works, and Can You Really Tell the Difference? How Audio Compression Works, and Can You Really Tell the Difference? 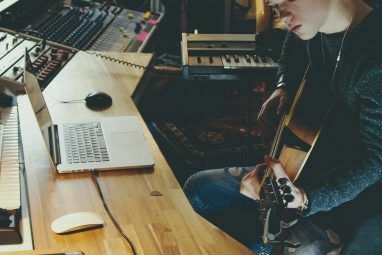 In this article, we'll take a look at how music compression works, and whether it has any real effect on how your music actually sounds. Read More under the Export menu. When you’re happy with your song, why not share it? Select a project and hit the arrow to reveal your scenes, then hit Export. You’ll need to Render your track as audio, so be patient while it’s recorded to file. 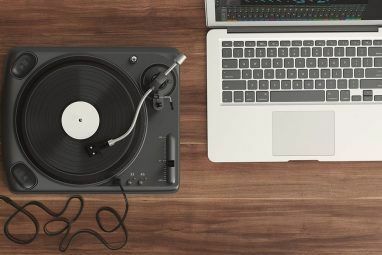 You can then Export straight to SoundCloud 7 Reasons Why You Should Start Using SoundCloud Today 7 Reasons Why You Should Start Using SoundCloud Today SoundCloud is often thought of as a hangout for indie kids and backyard bands - a place to discover new music. And that's true to an extent, but it's far from the full story. Read More , or create a compressed video or audio version. For the highest available quality, hit More and choose Uncompressed WAV. What lends Auxy more credibility than apps like Figure is its ability to function as a proper MIDI editor. Every pattern you create or drum beat you program can be exported as a universal MIDI file for use in literally any music production suite. You can then take your creations to new heights using more powerful desktop production suites. Simply choose your track, hit the arrow to reveal your scenes, then hit Export (twice). From here you can choose More, then Export as MIDI. 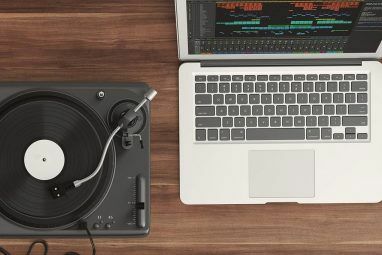 As you grow and become a more proficient producer, you may want to invest in a proper digital audio workstation to turn your patterns into polished productions. Or you can keep using Auxy for what it is: a fun musical tool with some real-world creative uses. If you’ve created anything with Auxy, or any other iOS music apps, we’d love to hear it. Why not drop a link to your SoundCloud in the comments below? Explore more about: MIDI, Music Production. How to Use Your iPhone as a Webcam: 5 Methods That WorkGoogle Assistant vs. Siri: Which iPhone Voice Assistant Is Best?